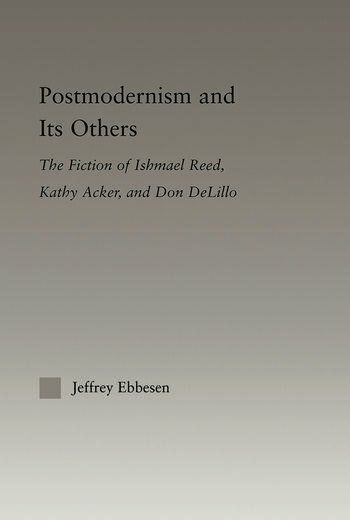 The book analyzes Ishmael Reed [Mumbo Jumbo], Kathy Acker [The Adult Life of Toulouse Lautrec by Henri Toulouse Lautrec], and Don Delillo [White Noise], three authors whom critics cite as quintessentially postmodern. For these critics such works possess formal narrative and/or content qualities at odds with modernism. In particular, according to influential thinkers like Fredric Jameson, postmodern works possess narrative form and/or content which eschews reality, and embody a fundamental paradigm shift from the politically committed ideology of modernity and modernism to the politically relativistic ideology of postmodernity and postmodernism. The book contends that while the above authors do possess numerous so-called "postmodern" qualities, their critical forms and/or contents remain ethically and politically grounded. As most postmodern theory rejects such grounding, its discovery in these prototypical postmodern novels suggests problems with the "postmodern" category itself.